Magdalena and German are the winners of the World Salon Tango Championship 2017 in Buenos Aires, Argentina. Their style is characterized by its elegance and expressiveness, as well as by its original musicality. They dance with passion but at the highest professioinal level. They are able to incorporate contemporary elements in tango while respecting the traditional dance. They have performed with many important and renowned dance companies, performing in theaters in Argentina and in the world. They have also participated in innumerable International Festivals, sharing their love for tango. Magdalena Gutierrez began her tango career in the year 2000. She attended several Tango schools with a variety of of the most famopus teachers in Buenos Aires. Her professional career as an artist and dancer took off a couple of years after as she was performing in various tango houses in Buenos Aires: Tango Complex, Piazzolla Tango, and Tango Gala. Magdalena was part of the cast of great tango shows, which have been known worldwide, such as Divine Tango (Passions Company, touring through Spain, Italy, Greece), Tanguera (National Theatre, Argentina), Evita (South Korea), Tango Emotion (Teatro Nacional, Argentina), and Chantecler Tango (Paris, Tokyo, Teatro Alvear, Argentina). She is also a member of the "Cuadro de Jovenes de la Academia Nacional del Tango" (Youth of the National Academy of Tango). She also toured around the world with her then partner, the great teacher and dancer Horacio Godoy. In 2015 she started working with German when they joined the Mora Godoy Company, performing the show "Bailando Tango" in the famous Astral Theater, in Buenos Aires. 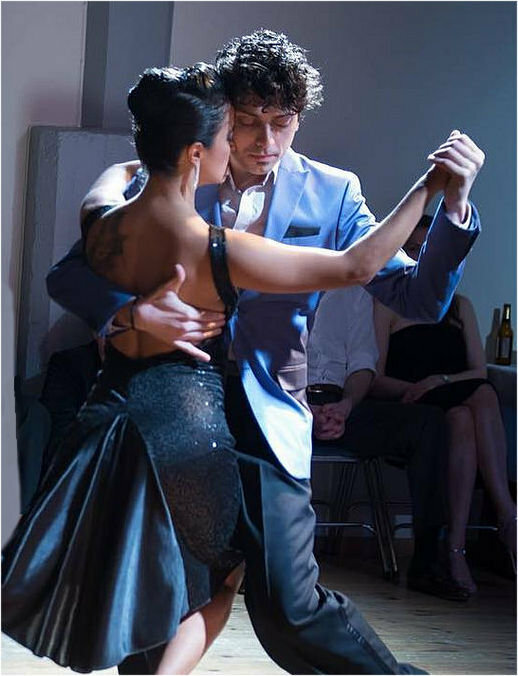 German Ballejo is a young tango professional, who stands out for his musical, creative, and elegant dance. With an extensive background on the stage and his love for tango salon style, he is characterized as being a complete dancer, expressive, and with great acting and teaching skills. In 1995, at the age of 10, German attended his first dancing lessons. His formative years were crucial to his present dance style as he took classes in various academic institutions and was part of several groups of choreographic dance. This blend between the creative side of the popular dances and the professionalism required to work on the stage is a defining trait of his art. In 2010, he moved to Buenos Aires where he began his career as an artist and dancer working in different tango houses: Complex Tango, Gala and La Ventana. Also, he performed in companies like Tempotango and Pasion de Tango, which gave him the opportunity to go through some of the most important stages and local theaters in Buenos Aires. In 2014, he worked for the prestigious and famous Spanish singer Julio Iglesias. In 2015 he joined the Mora Godoy Company, where he partnered with Magalena performing the show "Bailando Tango"
Sabrina Masso and Federico Naveira are Tango Argentino dancers who are also very dedicated to their teaching. They started dancing together towards the end of 2011, each already having had more than 12 years of Tango dance and performance experience. They travel around the world sharing their deep and intimate knowledge of every aspect of this beautiful dance. 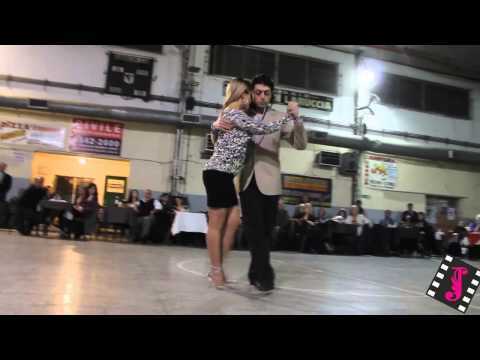 Federico Naveira was raised among the highest qualified dancers and teachers of Argentine tango, what made him one of the top exponents of the Argentine tango youth in Argentina and the rest of the world. At the age of 10, together with his sister Ariadna Naveira, he started to assist at the classes organized by his mother and legendary dance instructor Olga Besio. This opportunity gave him a rich experience and prepared him as dance instructor, and since then he has never stopped dancing and teaching. In 2008, together with other young instructors and dancers, Federico founded the "Postango" dance studio, a platform that gave him a new advantage point in his career this time as organizer and director. From 2008 to 2011, participated as teacher and dancer in many international festivals. He is also one of the founders at Tango Generations Show Cast. Sabrina Masso toured numerous venues in the world. She was part of companies like For Ever Tango, Tango Passion, O'tango and Tanguera among others, performing with great professionalism. Her vast experience and virtuosity made her a popular participant in numerous European festivals where she was able to display her mastery of the dance, showing skill and beauty with a taste for the traditional "walk" of tango and figures in close embrace. She joined the "Tango Generations" show in January 2012. Edwin Espinosa & Alexa Yepes have been dancing for more than 15 years. They met in 2011 and decided build a partnership together. Since then they have been crowned Vice World champion of Tango Salon in Buenos Aires in 2014 and World champion Milonguero in 2013 in Buenos Aires. Edwin and Alexa are recognized by their elegance, their connection and by their musical interpretation. Alexa Yepes has been since 1998. Born in Medellin, Colombia Alexa started her profession as a dancer in several dance companies when she was 7 years old. Her first group was "El balcon de los Artistas" where she learned her first dance steps. She attended different schools like, "Dancing", "Comfenalco" and "BNF", where she studied several disciplines of dancing. At the age of 17 she decided to make Tango her full time profession and entered the Tango company "A puro tango". She also danced with the companies "Astro Tango" and "Tango Chique". Edwin Espinosa is from Bogota, Colombia. Edwin discovered tango when he worked as a waiter in a tango restaurant, where they had regular milongas and teachers visiting at the weekends. He started dancing and attending milongas. Soon he wanted to make tango his profession and joined a dance school in Bogota. He wanted to learn different dance styles to complement his skills in Tango. Tango became his passion and by 2008 he won the National Tango Championship of Colombia three times. In 2011 met Alexa in Medellin they started their professional training together. This year we welcome Pablito Greco & Anastasia Fina as our Beginner Workshops teachers. This is a weekend intesive course that gets you up and dancing within one weekend of classes. With over 10 years of professional tango performing and tutoring around the world, and more than 5000 teaching hours to hundreds of students, Pablito Greco is a vivid example of what you can do with strong foundations, creativity, and genuine tango passion. In the Beginner Intesive couse you will learn the fun, elegance, grace, improvisation skills, as well as the secret tango etiquette. You will be introduced to Tango structure, technique, and musicality that will get you up and going on the dance floor.